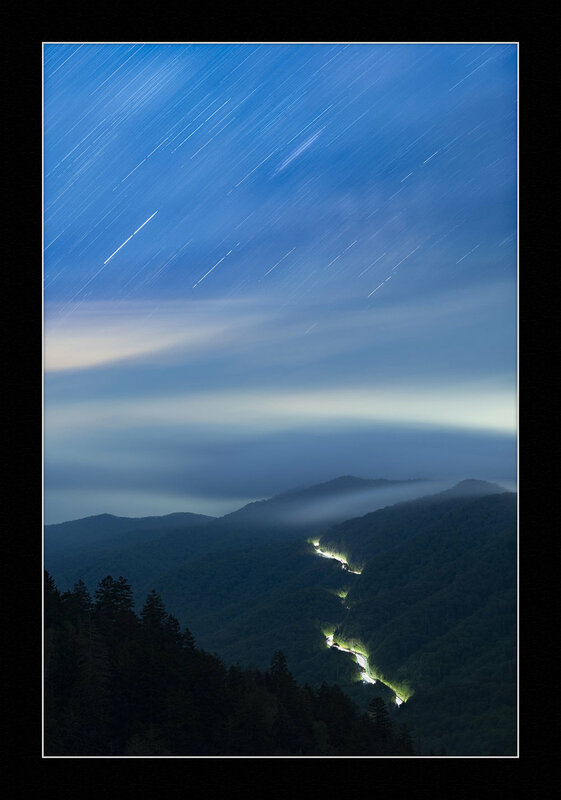 Car and Star Trails in Great Smoky Mountains National Park. © 2018 Matt Hill. Choosing what you want to include in the frame is often an iterative process. Doubly so when shooting at night. When I was spending some time shooting in Great Smoky Mountains National Park (hint: We are offering an amazing workshop here in 2019! ), I was getting to know the place—finding its essence in the darkest hours. 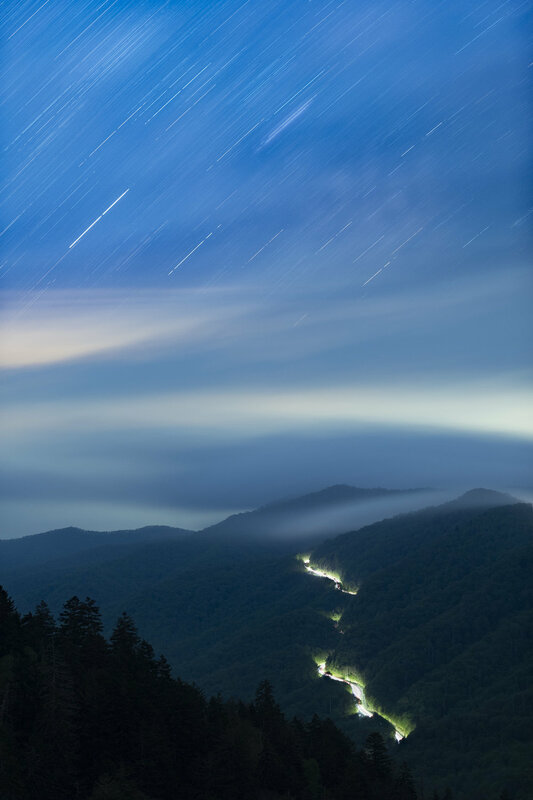 I drove up to Newfound Gap, anticipating an even more spectacular view under the stars than I had seen in broad daylight. Using PhotoPills (above), I knew when and where the Milky Way would be. 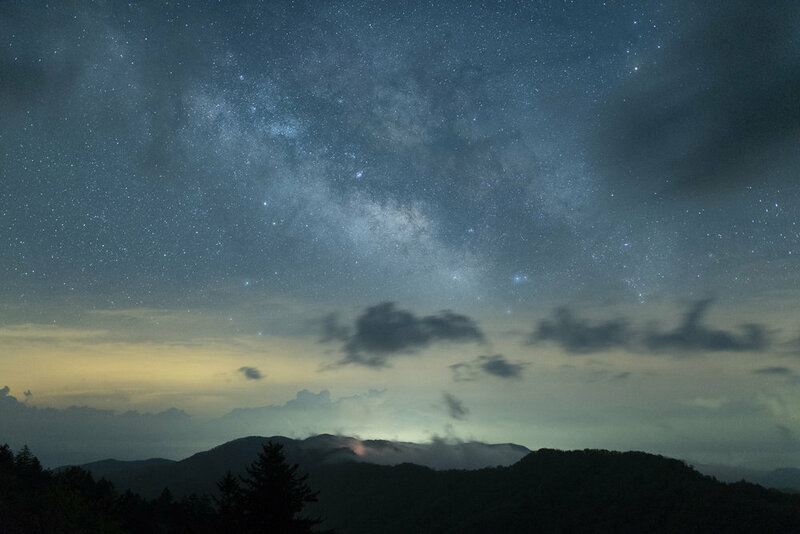 With that info in hand, I planned to be at Clingman’s Dome earlier for dusk and first darkness, leaving enough time to make my way back to Newfound Gap to shoot the galactic core of the Milky Way. Alas, the clouds came early. Nikon D750, Zeiss 15mm Distagon f/2.8. 22 seconds, f/2.8, ISO 6400. And my first shot was great! Loved those car trails. But the photograph was not a complete story, nor the story I thought should be told. So I decided to light paint the trees in front of me. This was OK, but not good. There was no way to sidelight the trees, outside of rigging myself and descending the steep mountainside. So I decided to rip a long exposure to capture some movement—to get kinesis in the photo. Nikon D750, Zeiss 15mm Distagon f/2.8. 8 minutes, f/2.8 ISO 400. I really liked it. Great tonal range, great movement. But darn, were those car trails calling to me! But they were so … tiny. So I swapped the 15mm lens out for my trusty Nikon 70-200mm f/2.8 and punched in on that detail. I was aiming to get a good balance between sky and earth, while making the car trails more important. Nikon D750, Nikon 70-200mm f/2.8 at 70mm. 60 seconds, f/2.8, ISO 6400. Better. But … Still. Not. Right. Ah, now I felt like I had the balance I wanted. Next, all I needed was some motion. And car trails! So I applied the Six-Stop Rule and aimed at 16 minutes. The weather was cool, but not cold. I know my D750 can handle an exposure that long without long exposure noise. Nikon D750, Nikon 70-200mm f/2.8 at 70mm. 16 minutes, f/2.8, ISO 400. Nailed it. You know when you get it right. 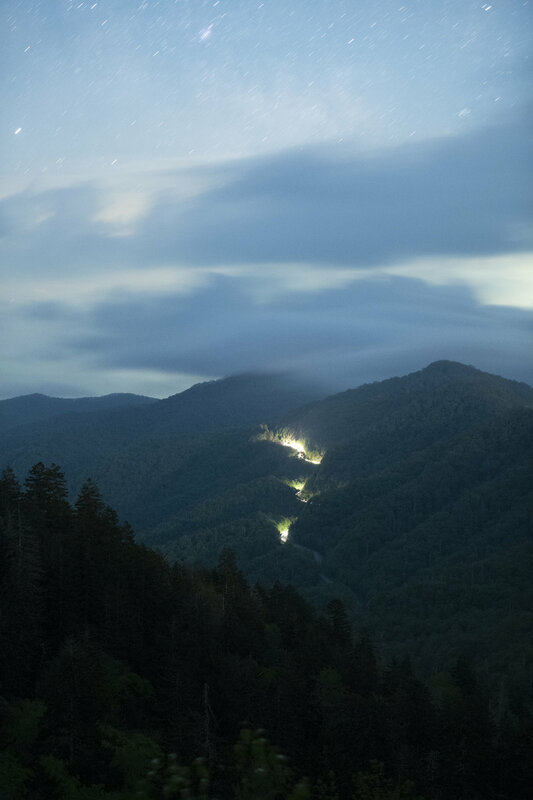 The clouds passing over the mountaintops; the long, bright car trails lighting up the forest edge; the mild definition in the foreground trees. I loved it. I put on the lens cap and moved on, despite not getting the Milky Way shot I’d wanted. But … Patience paid off when I waited out the clouds. :-) Got the other shot anyway! Nikon D750, Sigma 35mm f/1.4 Art lens. 11 seconds, f/4, ISO 6400.